Enjoy some of Aysen’s most proclaimed jewels, such as the Marble Caves on Lake General Carrera, as you head down the Southern Highway, wandering into the heart of the Andes. Hike in search of condors, pumas, vizcachas and huemules in the recently reclaimed and beautiful area that is now Patagonia National Park. Meet at the Balmaceda/Coyhaique airport and get started on your adventure in Aysen. You'll head south, along the Carretera Austral, through the beautiful Cerro Castillo National Reserve, with a stop for lunch overlooking the beautiful Ibanez River Valley. From there, you'll head to Puerto Ingenerio Ibanez, where you take the local ferry across Lake General Carrera to the town of Chile Chico. Relax at a beautiful bed and breakfast, La Hosteria de Patagonia, where you can enjoy their secret gardens and appreciate the amazing collection of antiques. Load up on the hosteria's amazing breakfast buffet and head out towards Argentina as you enter the Jeinemeni National Reserve. Take a short side-hike from a trailhead off the road, to see the incredible rock formations of the Lunar Valley, Piedra Clavada and ancient wall paintings from the Tehuelche Native Americans. After a boxed lunch on the trail, you'll jump back in the car and take the gravel road to the entrance of Jeinemeni, at the river crossing near Lake Jeinimeni. From there you have a short hike (approximately 4kms) to the campsite alongside the beautiful Lake Verde. After breakfast in a small shelter made by volunteers, you'll begin your journey to Valley Chacabuco and Patagonia National Park through the Gloria Mountains. You will begin your day walking along the river bed of the Jeinimeni, before ascending over the Gloria Pass to breathtaking views of Lake Verde. This is the hardest day, with a steep but short incline as you reach the pass. From there, the descent to the shores of the lake and a hike to a beautiful old shelter newly renovated for camping overnight. Approximately 8 kms. If feeling motivated, head out on an afternoon side hike to check out one of Jeinimeni's famous hanging glaciers. Break camp in the late morning and head out through the Hermosa Valley and it's weaving streams. This is one spot where you will appreciate the towering mountains all around you as you hike through this remarkable valley towards Mount Jeinemeni. There will be many streams to cross, so keep your water shoes handy and be prepared to get wet! Once finally reaching the lenga forest, there'll be a short lunch break before continuing through the beautiful emerald forests to the last campsite in the backcountry. You'll pass many run down shelters, used by gauchos when the park was one of the largest sheep ranches in Aysen, you'll camp at one of them near the Aviles River. You'll also have opportunities to see the Magallanes woodpecker tapping on the trees and if quiet, have a chance to see the ever increasing mountain lion population. 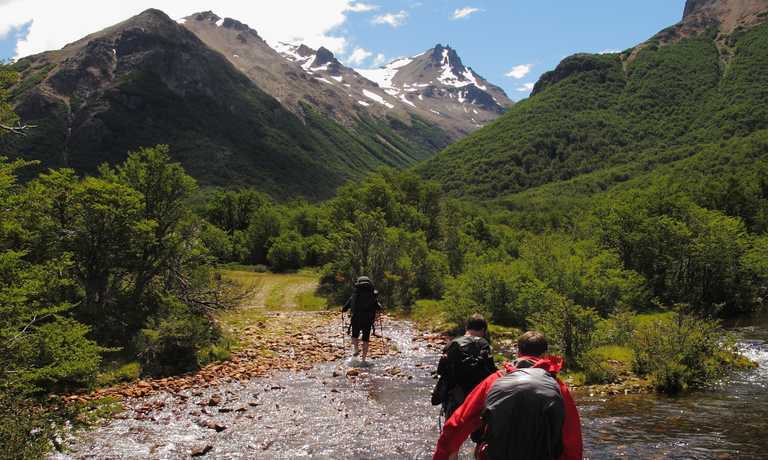 The final but most exciting day hiking through the Aviles Valley, you'll have entered the Chacabuco Valley and start the hike along the Aviles River. The Patagonia National Park has done an amazing job with trail maintenance, adding two suspended bridges over the Aviles gorge, making this day the easiest of them all. Great views of Mt. Pinturas and Mt. Kristine are a pleasant surprise, with native guanacos (wild llamas) peeking around every bend. As you head into the valley, the expanse of the Patagonian grasslands are truly splendid and humbling as you make our way to the Stone House campground of the national park. You can spend the night camping at the recently built Stone House campground, or guests have the option to stay at the luxurious national park lodge. Today's excursion is based on you! If you haven't had enough magnificent views of the Chacabuco Valley, head out with your guide along the Lagunas Altas trail, for approximately 21 km. The intensity of this trail is medium to difficult and it offers tremendous views of the northern ice field, the Jeinemeni Mountains and entire valley. Enjoy a dip in the cold, mountain lakes, or just take in the fresh air on your last day in the wilderness of Patagonia. If you are looking for a day to just hang out, you can take a drive through the park and enjoy the pampas as you hunt for guanacos, flamingoes and soaring condors. The night's accommodation for these two options is either at the park lodge or a bed and breakfast in the nearby town of Cochrane. Finally, you could choose to drive north to the town of Puerto Tranquilo and stay overnight at the eco lodge, "El Puesto,". 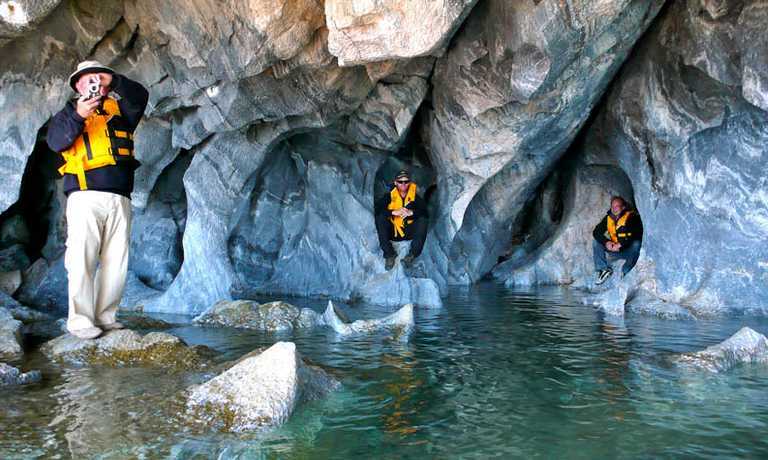 Then enjoy a leisurely two-hour morning kayak trip on Day 7, to the famous marble caves on Lago General Carrera. On your last day in Patagonia, head back north along the Southern Highway and get ready for an exciting road trip! You'll pass the quaint towns of Puerto Tranquilo and Cerro Castillo, with a quick stop at the Marble Caves on the glass-bottom jet boat, Karut. After a quick lunch, get back on the road to make your late afternoon flight out of Balmaceda. This trip can run as a group trip, with prices starting from $1,460 per person for a complete group. If you are looking to join a group or you are a solo traveller we will help to form likeminded groups of travellers. Please let us know your travel plans. Prices are per person and are based on a group of 6-8 people in basic accommodation.